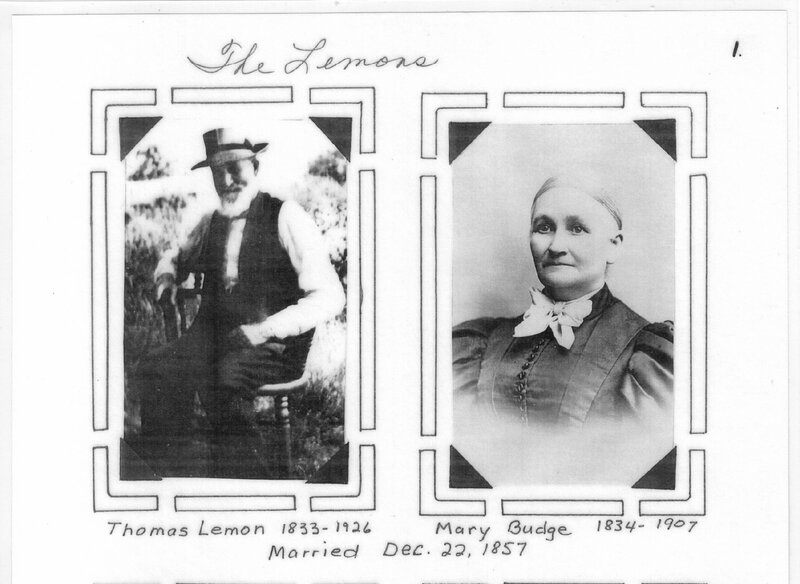 William Thomas Lemon (1833 – 1926) and Mary Budge (1834 – 1907) were married on 22 December 1857. 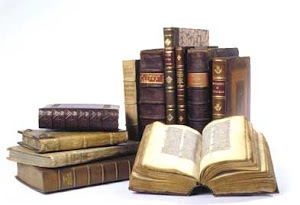 Before their move to Aldershot, they were listed in the 1881 Census as living in Beverly Tsp., Cty of Wentworth North: Thomas Lemon, b. Ont, Farmer, age 47; Mary, b. Scotland, age 45; and their children Alfred 21, Alan 19, John 17, Charles 17, James 15, William 13, and Jessie 11. 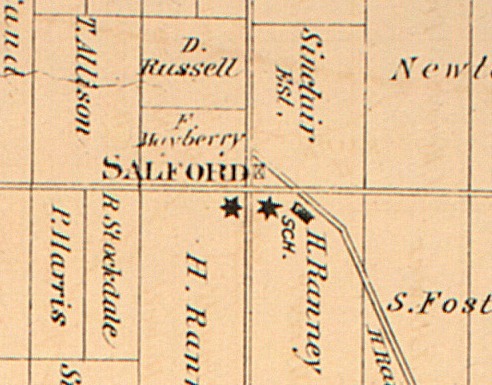 In 1881 he purchased 84 to 86 acres of land in East Flamborough Tsp., Aldershot, which had been the property of Joseph Hancock (since the 1870s) in 1875. The single buggy-tracked lane originally known as Lemons’ Road later became Lemonville Road. Thomas and Mary’s grown children soon married: Alfred (1859 – 1950) married Louise Schmuckle in 1895 in Los Angeles; , Allan (1861 – 1936 ) married Henrietta “Nettie” Scheer in January 1895; Charles “Charlie” (1863 – 1923) married Martha Hopkins in December 1893; his twin John Fredrick (1863 -1949) married Ida Scheer in January 1894; James “Jimmie” (1965 – 1959) married Annie McNeilly in January 1894; William “Will'”(1867 – 1948) married Mary Jane Hayward in June 1892; Jessie (1870 – 1963) married Fred Gardiner in March 1902. Alfred moved to California in 1888, apparently looking for a better farming climate after a partial crop failure following severe frost. His younger brother James moved there in 1895. “Wm. Thomas Lemon an Episcopal Methodist lay minister, after a few days illness, went home to be with the Lord, at his residence in Aldershot Ontario in his 93rd year. The funeral took place on June 8, 1926, with a large number of relatives and friends present. 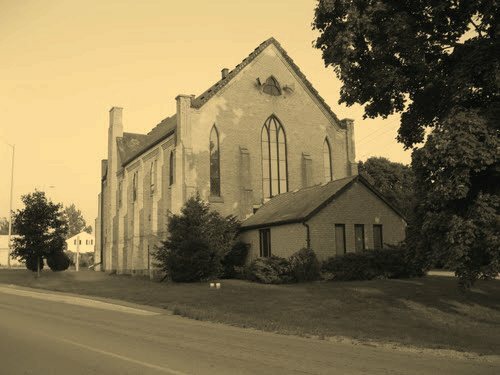 The service was conducted by Thomas Somerville of Brantford, ON who vividly recalled, in his eulogy, some of the blessed seasons, 50 years ago, when he became acquainted with Thomas Lemon preaching the Gospel to 400-500 on a Sunday afternoon for 6 successive summers in the woods near Lynden, ON., which was a short distance from his farm. Thomas Lemon erected a fine hall on his Lynden farm, where for many years, meetings were held and souls saved and Christians led on in the truths of God’s Word. He now has gone to the bright Home to spend eternal days. Church History – SALFORD – A village in the township of Dereham, County of Oxford, Ontario. Ingersoll Circuit. MOUNT FOREST. A town in the township of Egremont, County of Grey, Ontario. It was part of Durham Mission. Originally known as Maitland Hills, its name was changed to Mount Forest in 1853. The name change came about because it was discovered that the village was actually on the Saugeen River system not on the Maitland River as had previously been supposed. Mount Forest is on a height of land near the headwaters of the Saugeen River. 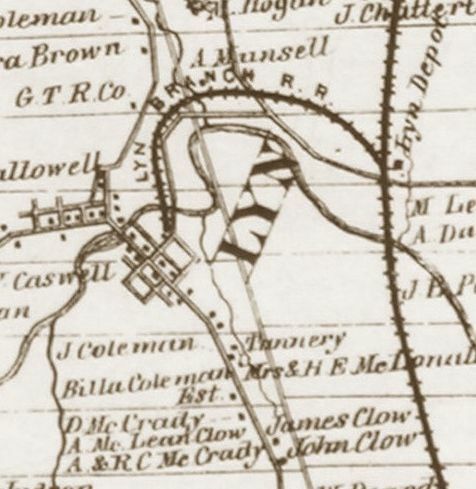 The village was surveyed into lots in 1853 by Francis Kerr, PLS. By 1864, the population had grown to 1185 so that it qualified to be incorporated as a village. By 1879 it had become an incorporated town. The 1871 town directory stated that Mount Forest had 10 hotels, eight churches and 18 stores. Later that year the railway was completed and the first train entered Mount Forest pulled by a wood-burning engine. A local newspaper, the Mount Forest Confederate, was first printed in 1867. For the first year, the newspaper was sent to village residents free of charge, but the second year it began charging 50 cents per year. The first public school was built in 1856. The first high school was originally in the Old Drill Hall, but was an unsuitable location because it was beside the Market Square where livestock sales were held monthly. The new high school was built in 1878. A third high school was founded in 2004 with the combination of the Mount Forest District High school and the neighboring Town of Arthur. 1863-1864 Rev. Samuel C. Philp, Jr.
MOORETOWN. A Village in the township of Moore, on the River St. Clair, County of Lambton, Ontario. Distance from Sarnia 10 miles. It was first established as Sutherland’s Landing. Mooretown gained in prosperity during the 19th century as a port of call for sail born vessels requiring assistance to pass “The Rapids” where steamboats driven by cord wood stacked on Mooretown’s piers could be towed up river into Lake Huron. The original Scottish settlers estabilshed a church at Sutherland’s Landing (now between Mooretown and Courtright) which was then moved to Mooretown in the 1860s when the oak logs of the original structure rotted out. The 1860s structure was struck by lightning in 1918 having been built of local timber with a copper clad steeple known to mariners as a navigation point. The 1919 replacement structure is now on the Moore Museum’s grounds having been preserved by artist Christine Anne Wingfield-Brandon. The structure retains the steeple bell from the original Sutherland’s Landing Church. Mooretown served as a regional center for salt mining and oil refining before these industries move to neighboring communities. A village on the B W & S S M R, in Eiizabethtown Township, Leeds County, Ontario 6 miles west of Brockville, the county seat, and 1 mile north of Lyn Station, on the G T R. It contains Methodist, Anglican and Presbyterian churches and a public school. Telgraph G N W. Exp, Can and Dom. Telephone connection. Pop, 500. The Methodists seem to have been the first to build a church. In 1817 the Genessee Methodist Conference met in the Elizabethtown (Brockville) chapel. Sixty ministers from New York State and twenty-two from Canada assembled in the village for five days. 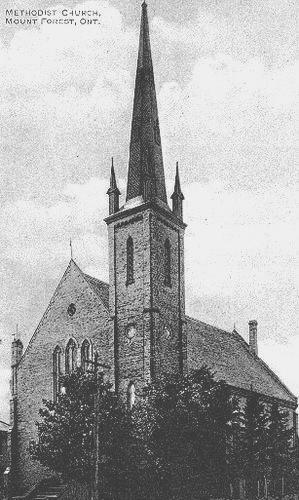 This was the first Methodist Conference ever held in Upper Canada. As time passed there were divisions among the members and also the Canadian church was formally separated from the church in the United States. 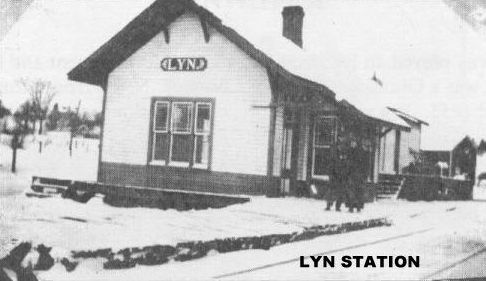 Eventually there were two Methodist churches in Lyn — one, a brick church at the top of the hill (beyond Erle Miller’s home) and the other near the stone school house on Main Street. The Episcopal Methodist church blew down in a severe storm and the present one, Wesleyan, still stands. (St. Andrews U.C.) 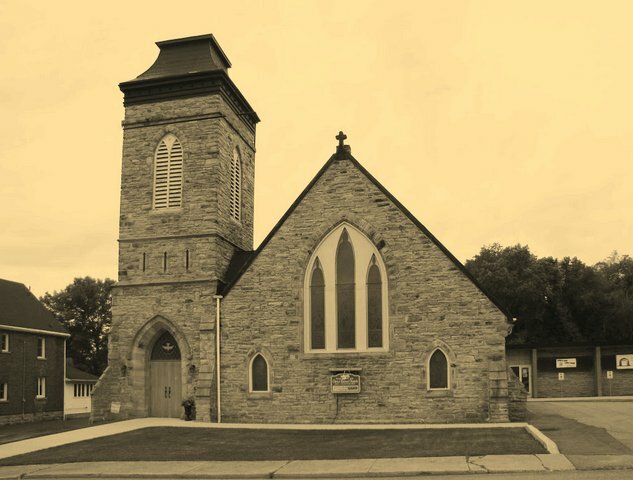 In 1884 these two churches finally decided to amalgamate and the Board of Wall Street Church in Brockville was asked to decide which church to use. They unanimously selected the Wesleyan Church. This church was made of white brick with a 12 foot steeple. The site was a gift of Mr. Coleman and the parsonage land a gift from Mr. Shipman. The bell, cast in the United States, was ferried across the St. Lawrence by the Colemans and friends. It is now in Christ United Church. This was a four point charge at that time; Caintown, Mallorytown, Rockfield and Lyn. There were 300 in the congregation, 80 were from Lyn.